We have been watching Around the World in Eighty Gardens on the Living Channel. Sadly we wised up too late to the fact it was screening to catch the New Plymouth garden, Te Kainga Marire, which was featured in one of the early episodes but we have seen Monty Don (the host with an unlikely name) gallivanting around South America, the United Kingdom and Europe visiting gardens of his choice across the whole spectrum from very grand to very modest. There is a bit of an open verdict here about our Monty as a garden host, though it did strike us in the last episode that he does not show much interest in plants. He is presenting gardens as form and vision through history across the globe and certainly has a fine grasp of the big picture and an avid interest in the social milieu which prompts the establishment of different types of garden. Big picture gardening makes good television and is undeniably impressive but can also be quite impersonal. To be fair, Monty does intersperse with some little gardens but he does not focus on the plants. Maybe our ambivalence is because we like to see the little pictures within the big frame and gardening to us is all about a passion for individual and interesting plants as much as good form and design. We caught another programme which showed a London garden which was all green with not a flower in sight. They claimed no flowers at all but I am sure I saw a rhododendron so either the owner disbuds it or there was a slight exaggeration. It was a garden which was all about form and nothing at all to do with colour or seasonal change. Certainly it had a restful quality but it could perhaps be a little gloomy at times. Would I ever want to garden without flowers and seasonal change? Never. If we didn’t have the flowers, we wouldn’t have the tuis. At the moment the campanulata cherries are in full bloom. The tuis don’t sit still long enough for us to take a census but there must be over a hundred of them bickering and squabbling over the bounty. Photographer friend, Fiona Clark, has been videoing our tuis for the last two seasons and I will advise the website address when the sequence goes on-line but she became a little frustrated last week when one large and aggressive tui decided an entire tree she was filming at the time was to be his and his alone, fighting off all pretenders. Tuis are territorial birds not given to living in happy harmony, but it is a delight to see trees which are alive with swarming birds and to see entire flocks flying in to the most desirable trees in the morning. Campanulatas are the Taiwanese cherries (as opposed to the later flowering, more delicately coloured and often fluffy Japanese cherries). They can set seed a little too freely and indeed have been declared a noxious weed in Northland so if you are planting them, look for ones advertised as sterile, or that set minimal seed. While they can provide splendid food for tuis, we don’t need a jungle of wildlings in our native bush. If you already have one that seeds, stay on top of the seedlings because they are deep rooted and not that easy to eradicate if you let them get away on you. Our resident pigeons have reduced our crop of wildlings in recent years. If we gardened without flowers, we would not have had the ephemeral delight of the English snowdrops (galanthus) or this week’s dwarf daffodils which are in full flight. Similarly, if we gardened with only the big picture in mind, we wouldn’t be enjoying these tiny treasures either. 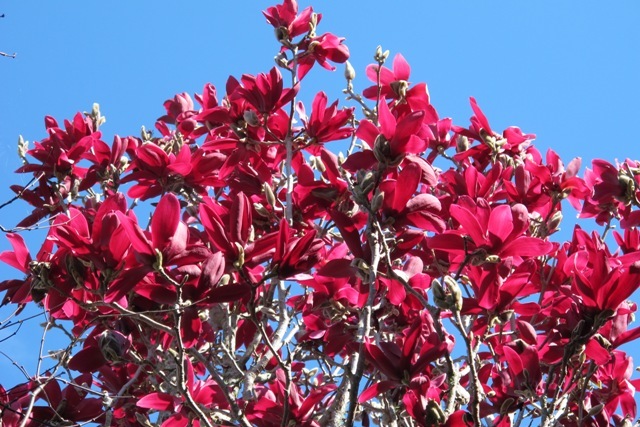 The flower-free zone would also mean missing out on the magnolias which are opening now. I had a very pleasant interlude at the weekend with a visit from an Auckland architect who was seeking magnolias for her new garden. Not for her the uniformity of evergreen magnolias or restricting her range to one variety only. No, she was after big, blowsy, spectacular and seasonal. I warmed to her instantly, recognising a fellow traveller. She knew and I knew that she was overplanting her small section, but she wanted to fit in as many OTT trees to cover as long a flowering season as possible. That exuberance is refreshing in an era when good taste in gardening and design is often equated to restraint bordering on the anally retentive. And it is unusual in somebody who works professionally in the design sector without a great background in plants. A flower free, or all green, or totally evergreen garden is usually designed to be as static as possible. Ditto the low maintenance garden. The creative process happens once at the very beginning. From then on it is straight maintenance, outdoors housework. There may be a bit of a makeover or renovation every five years or so but basically it is repetitive work to maintain the status quo. As one who finds housework a dull but necessary chore, the prospect of reducing gardening to the same level of repetitive activity does not appeal at all. What I like about gardening is the constant creative thinking and action. To achieve that, you need to be willing to change the scene by altering planting combinations, adding extra bits of interest, replacing underperforming plants, getting excited about discovering a plant you didn’t know about before, coming upon something new in flower or growth each week and responding to the changing environment. Those are the interesting parts, not doing edges and clipping and weeding. It is the vibrancy of plants and seasonal change that give life to a garden and for us that includes flowers and vast range of different plants all of which have their time to shine. Good design gives a framework to hold it all together visually just as good architectural design can create a splendid house but does not make it a home. Good maintenance presents it well. But it is the plant selection that makes it come alive. We will stay with the flowers and the birds here and watch the tuis while rejoicing in the OTT display of tree magnolias in full flower over the next month or two. This entry was posted in Abbie's column and tagged Abbie's column on 15 August 2008 by Abbie Jury.